However, my small tokens of affection were somewhat over-shadowed by the incredibly generous gifts I received - all totally unnecessary (but really lovely!). Annika made me a tea cosy with Hampus (Irene's dog) and Zoya (Annika's dog) on one side and our two cats on the other - even Mark was wowed by the tea cosy and insists it is displayed in the kitchen. 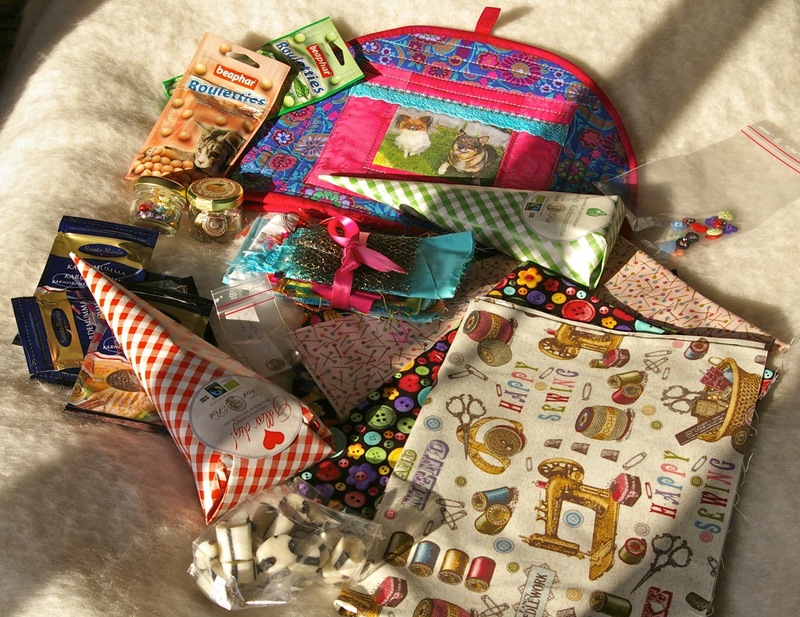 Annika also gave me some fabric and embellishments (you could say, haberdashery) for my stash and Irene gave me some sewing themed fabric and more buttons, while Anna-Karin showered me (and Mark) with sweet goodies...all yummy (we started them last night). Irene also keeps me stocked up with cardamom seeds, as here they are generally sold in the fiddly green pods - and there were even treats for Rio and Max (although Max is not allowed them because of his urinary tract problems, we have started sneaking them to Rio when Max is not around). my friends really spoil me! 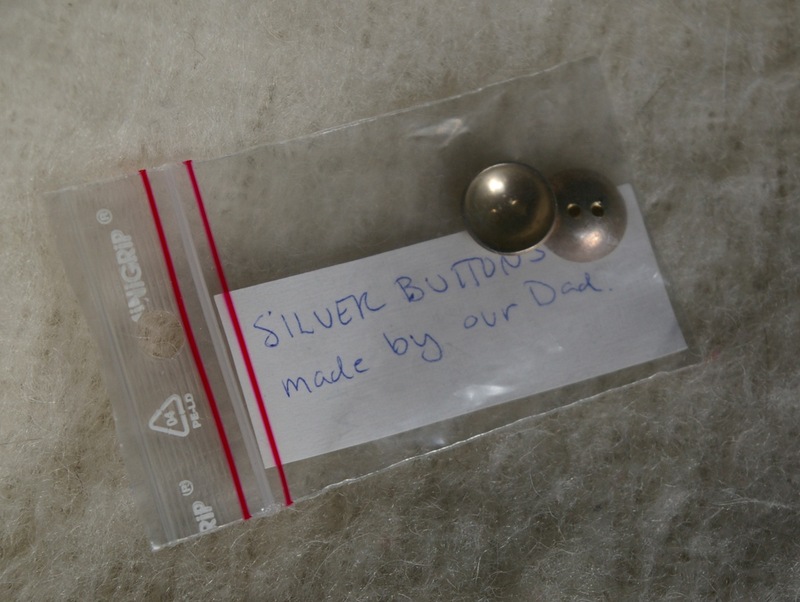 I love everything, but - if I am allowed to say - the silver buttons made by Irene and Annika's father are particularly special. You can see where Annika's silver-working talent comes from; there are some photos on her blog; you should have a look. 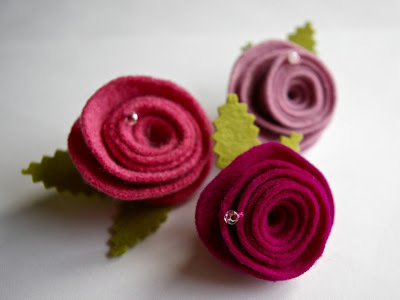 I was trying to work out the best way to use the buttons so they can be appreciated and realised I have a small amount of fabric that was my grandmother's and I think I will try to make myself a vintage style fabric brooch with the buttons in the centre - a little something by which to remember our loved ones. I always love a rose - and especially now when we are back in the Swedish arctic cold - thank you so much! No, thank you! As always you have spoilt me - I love the fabric and buttons and am really looking forward to creating something. What a lovely gift exchange! Your roses are really beautiful, Sue! And those silver buttons are fantastic. What wonderful treasure! Thanks Eirlys - it is something of a treasure hoard!